Elkhenany, H. Regenerative Medicine Weapons to Fight the Degenerative Defect of Musculoskeletal System Disorders. (2016) J Stem Cell Regen Biol 2(2): 92- 93. © 2016 Elkhenany, H. This is an Open access article distributed under the terms of Creative Commons Attribution 4.0 International License. To stop the extension of tissue degeneration resulted from any disease, you can use the usual treatments antibiotics, anti-inflammatory, anti-histaminic and so on. But to fight the degenerated tissue itself and restore its function and healthy structure, you will need more advanced and strong weapons. 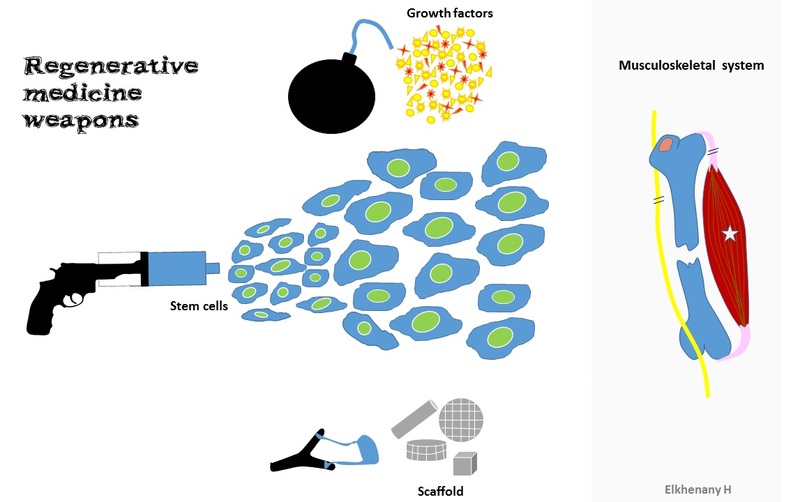 In the regenerative medicine field, there are 3 major weapons which are stem cells, growth factors and scaffolds. In the past, doctors used to use only one of them at a time but nowadays they tend to combine 2 or the 3 in one shot. The concept of combining the stem cells, growth factors and scaffold was demonstrated to be efficient for regeneration of bone[1,2], cartilage, muscle, tendon and nerve. Most of these studies was conducted at in vitro and in vivo level, supposing that will perform the same efficiency when be applied in the clinical cases. 2. Ren, X., Weisgerber, D.W., Bischoff, D., et al. Nanoparticulate Mineralized Collagen Scaffolds and BMP-9 Induce a Long-Term Bone Cartilage Construct in Human Mesenchymal Stem Cells. (2016) Adv Healthc Mater. 3. Reppel, L., Schiavi, J., Charif, N., et al. Chondrogenic induction of mesenchymal stromal/stem cells from Wharton's jelly embedded in alginate hydrogel and without added growth factor: an alternative stem cell source for cartilage tissue engineering. (2015) Stem Cell Res Ther 6: 260. 4. Ansari, S., Chen, C., Xu, X., et al. Muscle Tissue Engineering Using Gingival Mesenchymal Stem Cells Encapsulated in Alginate Hydrogels Containing Multiple Growth Factors. (2016) Ann Biomed Eng 44(6): 1908-1920. 6. Tang, S., Liao, X., Shi, B., et al. The effects of controlled release of neurotrophin-3 from PCLA scaffolds on the survival and neuronal differentiation of transplanted neural stem cells in a rat spinal cord injury model. (2014) PLoS One 9(9): e107517.